Maryse, who is already in the ring, introduces The Miz (who is also already in the ring. The Miz starts to introduce Miz TV when Dean Ambrose quickly interrupts and heads to the ring. 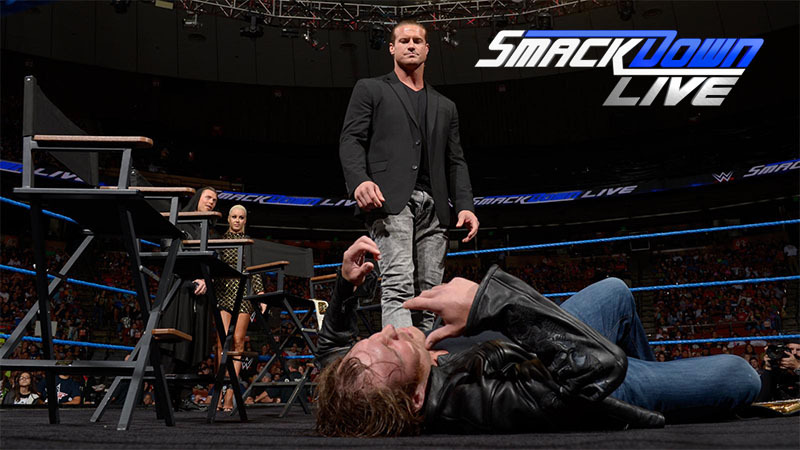 Ambrose starts to speak when Dolph Ziggler interrupts and heads to the ring. Ziggler and Miz get face-to-face, but Miz stops them from fighting. The Miz talks about Ziggler’s career resurgence, but wonders what will happen if he fails. Ziggler isn’t worried about what comes after Summer Slam, he’s only worried about winning the title. Ambrose isn’t buying Ziggler’s attitude. Ziggler doesn’t like what Ambrose has been saying and says that Ambrose will have to admit that he’s been fueling Ziggler’s desire to win after he becomes the new champ. Ambrose says that Ziggler isn’t ready for the pressure of being champ. He doesn’t want it bad enough. Ziggler says that Ambrose doesn’t have enough to beat him, and as he’s talking he superkicks the champ. An okay, yet pretty fun match. As expected, it quickly broke down and turned into a parade of big moves traded by the teams as people rolled in and out of the ring. Naomi heads to the ring with a fun, new black-light entrance. Eva Marie is introduced, but the announcer says that she has been delayed because of traffic. She can’t compete again this week. AJ Styles is a little jealous of Alberto Del Rio tonight because he gets to beat up John Cena. Del Rio isn’t interested in Styles’ pep talk. Curt Hawkins has counted to infinity. Twice. Curt Hawkins can slam a revolving door. Curt Hawkins doesn’t flush the toilet, he scares the crap out of it. Not really a match. It was just Orton punching Slater until he got disqualified. After the match, Orton continues the attack and DDTs Slater on the floor. He also German suplexes Slater in the ring before giving him an RKO. Heath Slater is being looked at by the trainer when Shane and Daniel tell him that he won. Slater is out of it after the beating he took and mistakes Daniel and Shane for Foley and Stephanie. Shane takes back the contract offer. Pretty good match. Pretty straightforward. Rowan had some good offense here and there, but Ambrose is the champ, so, he was never really that much in trouble. After the match, Bray Wyatt looks at Rowan’s sheep mask, tosses it into his rocking chair, and walks away leaving Rowan alone in the ring. Pretty good match. And as a bonus, it made Naomi’s new entrance make sense (she came out to chase Eva Marie when she finally showed up at the arena). Just like last week, Baron Corbin is found attacking Kalisto. The history of the Lesnar/Orton match. Good match. It seemed to end a little abruptly and Del Rio seemed to take a lot of time between moves at times, but it was still good. After the match, Styles attacks Cena. He’s tired of hearing “the future goes through John Cena.” Styles’ time is now. Before Styles can leave, Cena hits him with an Attitude Adjustment. Cens then drags Styles to the floor and tosses him through the announce table. A pretty good show. I think it did well to build (or at least maintain) some interest in Summer Slam, specifically the big matches. It didn’t have a lot of great competition this week, but this was a solid match.